Terry Black's Barbecue vs. Black's Barbecue: Which restaurant comes out on top? Since 1932, Black's Barbecue in Lockhart has inspired impressive acclaim, awards and admiration for its signature succulent meats. 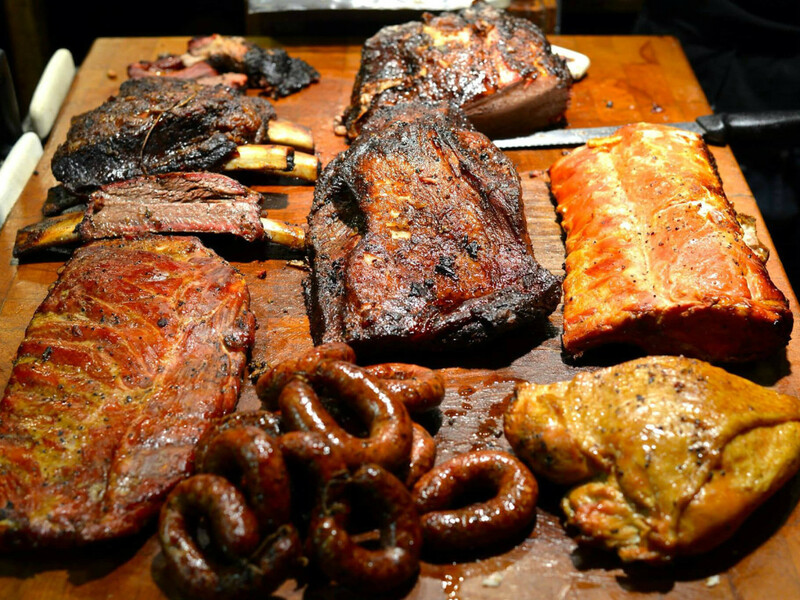 Pounds upon pounds of juicy charred brisket, grease-laden sausage, tender ribs and other flavorful proteins have been smoked and served in this establishment day after day, and as Texas' oldest same-family owned restaurant, Black's Barbecue has inspired a following of carnivorous fans. Though not much has changed since this culinary family opened its bustling business more than eight decades ago, members of the Black family have recently embraced change in our ever-expanding Central Texas barbecue landscape. Two young family members in particular, Mike and Mark Black, have broken off to form their own interpretation of the famous family's menu — and the bold move has ruffled some feathers. In an early business model, the twins planned on naming the new restaurant Black's Barbecue Austin. Their uncle, Kent Black, third generation pitmaster and current owner of Black's Barbecue in Lockhart, filed a cease-and-desist order, citing that the brothers didn't have permission to use the family name and that their cooking styles and barbecue techniques differed from the original family restaurant. Following the surprising legal move, the younger Blacks opted instead to use their father's name, Terry Black, and embarked upon building a new Austin restaurant at 1003 Barton Springs Rd. In an interesting turn of events, Kent Black announced that he would also open an Austin outpost at 3110 Guadalupe St., thus inspiring an inevitable sense of competition among the two barbecue houses. Now that both Terry Black's Barbecue and Black's Barbecue have both opened their respective doors, we decided to run a taste test to compare how the two restaurants measured up against each other. When it comes to the most important discussion of all — smoked meats, of course — the original Black's Barbecue comes out on top. While we don't have any major qualms with Terry Black's pit-produced proteins, there are notable inconsistencies in the overall meat spread. Terry Black's sausage (the best of all the options) and turkey were succulent and flavorful (a difficult feat for poultry), but the brisket and pork ribs were overtly overdone, lacking in flavor and often chewy. We were hoping for well-seasoned, tender meat, but received quite the opposite. The brisket was the worst of the options, which pains us to say as barbecue fanatics. Beef and pork almost always need to be the chief proteins in order for a barbecue establishment to thrive, so if Terry Black’s hopes to attract the necessary accolades, Texas Monthly mentions and devoted followers, a lot of work is needed in developing these meats. There are a handful of establishments that survive and thrive just fine without the fanfare and awards, but something tells me these guys won't settle for such a thing. Given the brothers' lineage, we see the potential for improvement, but their famous bloodline isn't enough to compensate for these proteins as they are now. Black's Barbecue, on the other hand, delivered a solid interpretation of the family's famed fare. Walking in, we were wondering how the new enterprise would preserve the prestige of its proteins since Black's now produces its meats in Lockhart over a wood-fired rotisserie and smoker and delivers them to the new Austin location. However, everything from the perfectly greasy sausage to the shiny brisket and tender pork spare ribs packed a punch of flavor, moistness and melt-in-your-mouth quality. As expected, the brisket, a slab of smoky beef with a thick black crust, is the star of the show, with the pungent sausage following closely in second. The turkey and sausage were quite similar to Terry Black's, which tells us there are definitely some family recipes the twins have mastered. In the end, the attention to quality, detail and consistency is what sets the original Black's Barbecue apart from Terry Black's. Side dishes are the supporting role in Texas barbecue, and in this arena Black's Barbecue once again takes home the bacon. To be fair, neither restaurant knocked it out of the park with side dishes and desserts. But whereas Black's Barbecue seems to make a genuine effort in preparing the fare, Terry Black's comes off as somewhat apathetic and sloppy in its endeavors. Terry Black's cole slaw and potato salad in particular look and taste like they came from the bulk prepared foods aisle in the grocery store. Many of the dishes seem like they're drowning in one primary ingredient, such as mayonnaise or dressing. The souffle-like creamed corn and savory pinto beans are the best of the options, but it's a shame the more traditional sides — in particular cole slaw and potato salad — don't find a better fate. The banana pudding seemed to have more whipped topping than yellow pudding, and the cobblers were neither wonderful nor horrible — they were simply forgettable. In truth, sides aren't designed to be the star of the show in most barbecue restaurants, and both restaurants seem to embrace that way of thinking. While Black's Barbecue is a near copy of its famous Lockhart counterpart, Terry Black's has a lot of room for improvement. We're not saying both of these restaurants can't successfully coexist in the same city, but if they're going to carry the same familiar name, we hope to see Terry Black's make the necessary changes to be on par with Black's Barbecue.